For the 1927 song, see The Best Things in Life Are Free (1927 song). For the 1956 film, see The Best Things in Life Are Free (film). (1992) "The Best Things in Life Are Free"
(1992) "Little Miracles (Happen Every Day)"
(1991) "The Best Things in Life Are Free"
(1992) "That's the Way Love Goes"
"Money Can't Buy You Love"
"The Best Things in Life Are Free" is a Grammy-nominated duet between American singers Luther Vandross and Janet Jackson, recorded for the Jimmy Jam and Terry Lewis-produced soundtrack to the 1992 American film, Mo' Money, starring Damon Wayans. The song was composed by Jam, Lewis, as well as Michael Bivins and Ronnie DeVoe. Additionally, the song was remixed by David Morales, Frankie Knuckles, and CJ Mackintosh. It was later included on Vandross' compilations One Night with You: The Best of Love, Volume 2 and Lovesongs, as well as Jackson's own compilations Design of a Decade: 1986–1996 and Number Ones respectively. In 1995, the song was re-released as the second single from Jackson's aforementioned Design of a Decade: 1986–1996 compilation album, exclusively in European countries, and included new remixes by Roger Sanchez, K-Klass and MK. In March 1991, Jackson signed an unprecedented $32 million contract with Virgin Records, the largest record deal at the time, although it was quickly exceeded by her brother Michael and his label, Epic Records. Prior to her first release with Virgin, Jackson was asked by Jam and Lewis to record a song for the sound track to the feature film Mo' Money, released in 1992 by their label Perspective Records. Jon Bream of the Star Tribune reported: "For most movie soundtracks, producers negotiate with record companies, managers and lawyers for the services of big-name singers. Like the Hollywood outsiders that they are, Edina-based Jam and Lewis went directly to such stars as Janet Jackson, Luther Vandross, Bell Biv DeVoe, Color Me Badd and Johnny Gill." It was the first all-new song Jackson recorded at the new location of Flyte Tyme Studios in Edina, MN, which was completed 2 months after wrapping up recording on her fourth studio album Rhythm Nation 1814 in May 1989 at the original Minneapolis studio. She had done re-recordings and remixes there from 1989 to 1991. "The Best Things in Life Are Free" is an R&B, dance-pop and house song with a "steady beat." It is written in the key of F#m and their vocal ranges span from the low-note of F#3 to C#6. The song is set in the signature of common time and has a moderate tempo of 120 pulsations per minute. It follows the basic chord progression of B7m—C#7m—F#7. Billboard wrote about the song: "First peek into the hotly anticipated soundtrack to the film "Mo' Money" is a glittery, star-studded pop/jack affair. Vandross and Jackson vocally swerve and weave around each other like they've been singing together for years. Added flavor comes from guest raps by Bell Biv DeVoe and Tresvant. The true kudos, however, go to the masterful Jimmy Jam and Terry Lewis, who have crafted a slammin' track that would work no matter what." In the United Kingdom the song was released in August 1992 and peaked at #2 in the UK Singles Chart, spending 13 weeks in the chart. It became Jackson's first top ten hit in the UK since "Let's Wait Awhile" reached #3 in 1987. The song was remixed in 1995 and re-released, reaching #7. It was the remixed version that was included on international releases of Janet's compilation album Design of a Decade: 1986–1996. It spent 5 consecutive weeks at #2 on the Australian Singles Chart, spending 18 weeks on the chart, And charting at #6 On the Year ends chart. In the United States, "The Best Things in Life Are Free" debuted at number 24 on the U.S. Billboard Hot 100 the week of May 30, 1992. Three weeks later, the song peaked at number 10 for three consecutive weeks and ended at number 41 on the year-end chart. The song also peaked at number one on the Hot R&B/Hip-Hop Songs. A music video was made for the song, although neither Vandross nor Jackson appear in it. Instead, the video features Mo' Money's stars Damon Wayans and Stacey Dash, at a carnival, lip-synching to the song; Damon's brother Marlon Wayans, who also appears in Mo' Money, has a cameo appearance in the video. Also included on the track is Michael Bivins and Ronnie DeVoe of Bell Biv DeVoe. Ralph Tresvant also has a very brief spoken line. He appears solo on the song "Money Can't Buy You Love" from the soundtrack. ^ a b c d Janet Jackson - The Best Things in Life Are Free Sheet Music (Digital Download). Musicnotes.com. ^ "Billboard: Single Reviews" (PDF). Billboard magazine. Retrieved 2018-01-25. ^ "ARIA Charts - End of Year Charts - Top 50 Singles 1992". Aria.com.au. Retrieved 2016-06-26. ^ "The Billboard Hot 100: Week Ending of May 30, 1992". Billboard. Nielsen Business Media, Inc. Retrieved 2012-05-13. ^ DeKnock, Jan (1992-06-12). "Kris Kross `Jumps' to new record". Chicago Tribune. Retrieved 2012-05-13. ^ DeKnock, Jan (1992-06-26). "Chart action slows as summer arrives". Chicago Tribune. Retrieved 2012-05-13. ^ a b c d "The Best Things in Life Are Free - Luther Vandross". Billboard. Nielsen Business Media, Inc. Retrieved 2012-04-04. ^ a b "Top Pop Singles 1992". Billboard. Nielsen Media Business, Inc. Retrieved 2012-04-02. ^ "Luther Vandross and Janet Jackson - The Best Things in Life Are Free (song)". australian-charts.com. Hung Medien. Retrieved 2012-04-04. ^ "Top Singles - Volume 56, No. 4, July 25, 1992". RPM. Archived from the original on January 17, 2016. Retrieved 2012-04-04. ^ "Nederlandse Top 40 – week 32 – 1992". Radio 538 (in Dutch). Top 40. Retrieved 2012-04-04. ^ "Hits of the World". Billboard. 1992-11-28. ISSN 0006-2510. Retrieved 2012-04-04. ^ "The Irish Charts - All there is to know". Irish Recorded Music Association. Retrieved 2012-04-04. 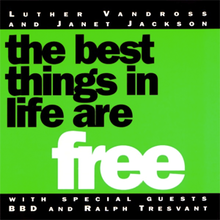 ^ "Luther Vandross and Janet Jackson - The Best Things in Life Are Free (song)". Sverigetopplistan. Hung Medien. Retrieved 2012-04-04. ^ "Chart Stats – Janet Jackson – That's The Way Love Goes". The Official Charts Company. Chart Stats. Retrieved 2012-04-04. ^ "ARIA Charts - End Of Year Charts - Top 50 Singles 1992". Australian Recording Industry Association. Retrieved 2012-04-02. ^ "End of Year Charts 1992". Recorded Music NZ. Retrieved December 3, 2017. ^ Christopher Dean (2011-04-07). "Australian Fun Countdowns: Accreditation Awards". Australianfuncountdowns.blogspot.com.au. Retrieved 2016-06-26. ^ "BPI Certified Awards". British Phonographic Industry. Archived from the original on 2009-09-24. Retrieved 2012-04-02. "Do What I Gotta Do"
This page was last edited on 11 April 2019, at 12:19 (UTC).